Who is shopping on Leith Walk? Parking on Leith Walk is a real problem for businesses at the moment and it’s really a case of motorists bringing a lot more business than cyclists. Everyone who lives and works on Leith Walk wants it restored so that we can encourage people back into the area. If people cannot park then they will not come down to Leith Walk and that will not help us at all. There is a vast difference between the number of vehicles that pass down Leith Walk in comparison with the number of bikes, so I don’t understand the need for dedicated lanes for minority road users. I don’t think I need to address that last claim — about cycling infrastructure being for the minority who are Cyclists — so soon after writing about it at length. It’s the earlier ones that merit a further look. Kavanagh clearly believes that the businesses on Leith Walk are, or are capable of, attracting customers from all over Edinburgh, who drive in and park up to shop. His belief is quite typical of small retail business owners. 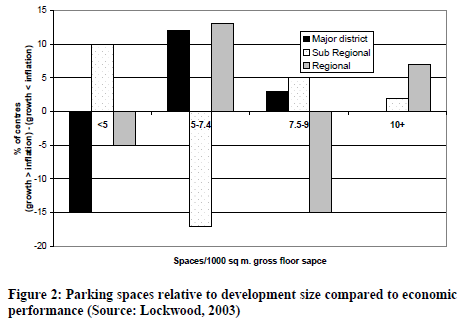 We have developed a national myth about the importance of motoring and car parking to urban retail. I’ve written before about how this myth was explored a few years ago on Gloucester Road in Bristol — a road which shares important characteristics with Leith Walk, namely, being an arterial ‘A’ road, running through a densely populated residential neighbourhood, and being lined with small independent businesses and a few convenience stores. The shopkeepers of Gloucester road were asked to estimate what proportion of their customers came by car. The average answer was more than two fifths. But actually only just over a fifth drove to the shops. They greatly underestimated how many people walked, cycled, or took the bus. Their estimates of how far their customers were travelling was also way out, with business owners believing that they are able to attract customers from miles around — just as Kavanagh does — when in fact most lived a short walk away. And they found little to support the idea that motorists were good customers, with drivers likely to rush in and rush out while pedestrians hang around and visit several different establishments. Mr Kavanagh’s business is relatively specialist. His is not the only print shop in Edinburgh, but perhaps it is the best quality or best service or best value or for whatever reason he really is able to attract customers from all over the city and beyond. But, and I hope the business owners of Leith Walk will not take this personally, very few of the shops on the street are. I don’t believe that anybody is going miles out of their way to go to a Co-op, a post office, a pharmacy, a bakery, a kebab shop, Tesco Express or their barber, accountant, or solicitor. It should not be taken as a slur on the reputation of the perfectly nice delis and coffee shops to state that almost all of their customers come from no further away than the office buildings a couple of minutes up the road and the tenement blocks around the corner, for this is the nature of delis and coffee shops everywhere. Leith Walk succeeds as a local high street because its shops and services are mostly local shops and services — the sort of essentials that everybody needs but nobody wants to have to go out of their way to obtain. Which is why I am fairly confident that if you surveyed the people who shop there, you’d find that most live locally and walk, many combine walking with the bus, more than Mr Kavanagh would expect cycle, and a lot fewer than he would believe drive (or ever would drive, however much car parking was provided). My guess is that of those who do drive, a very large proportion are making a journey of just a couple of kilometres — for we know that a large proportion of urban car trips cover very short distances — and that Kavanagh would again be surprised at how many would consider leaving the car behind — indeed, would be relieved to be able to do so — if they were to be given a viable alternative like safe and comfortable cycle tracks. And that would mean fewer local folk clogging up the parking spaces as they stop to spend 89p on milk, and more spaces for those who are driving in from miles around to spend big at the print shop. But we don’t have to argue over our guesses. Why not test it? The methods of the Bristol study were simple enough, and it might take one person a weekend to replicate, or a small group could do it in an afternoon. A “fact” was recently quoted at me: a third of people who have their bicycle stolen don’t bother replacing it, they just give up. * Thus, if we want everyday mass utility cycling, we have do something about bicycle theft. Boris Johnson would surely agree. In his 2008 transport manifesto, he claimed he would “make London a truly cycle-friendly city through increasing secure cycle parking”. Doing more to improve secure parking and stop theft are, of course, good things, and things that I have actively supported. But, in the words of the classic series from Freewheeler, it won’t bring about mass cycling. To understand why, you only need to imagine living the Netherlands and getting your bicycle stolen. In fact, you don’t even need to imagine it, because many cities in the Netherlands have very high rates of bicycle theft. In recent years, theft has been running at an annual rate of about 1 in every 20 Dutch bicycles stolen: many Dutch people will be victims several times in their lives. I’m pretty sure that the owners of these bicycles didn’t give up. Why would they? They got a replacement and jumped back on. People giving up as a result of one bicycle going missing is a sign of the much wider ill-health for cycling. Clearly cycling in the UK doesn’t hold much attraction if it takes just one set-back to make people give up forever. The Understanding Walking and Cycling project found that, in the absence of big changes to the infrastructure and to cycling’s image, there is not a very large population of British people almost ready to take to their bicycles, just waiting for a gentle nudge and the right encouragement. But clearly there are plenty who are almost ready to give them up. The headlines at the moment are about a supposed growth in cycling rates, focussed on urban centres where the growth appears to be real. But the same headlines were being printed in 1981 and a claimed recent growth in cycling was the opening line of this 1992 book. Cycling growth is going to remain extremely fragile so long as it’s expected to take place in the prevailing British traffic conditions. * I have not been able to verify this “fact” — not that I put much effort into it — but the exact number doesn’t matter. The EU are currently looking at whether to allow bigger and longer trucks. Birlea Furniture put together a helpful display of a double-box lorry, CX07AXU, on Tavistock Place, showing how they can be seamlessly integrated into our towns and cities. 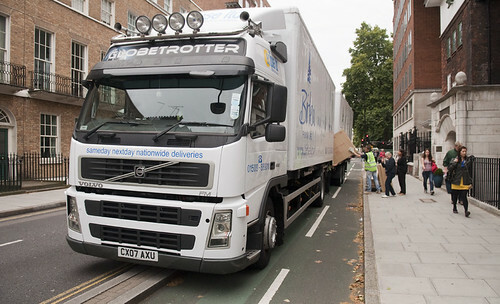 By driving over the kerbs and parking in the cycle track, which is designed for much lower weight loads, the driver has helpfully ensured that the road surface is kept in good condition, and that Important People aren’t inconvenicned. By forcing half a dozen cyclists each minute to swing out into the oncoming traffic, Birlea Furniture are sending an important message about the consequences that these bicyclists’ selfish choices have for fragile British business. 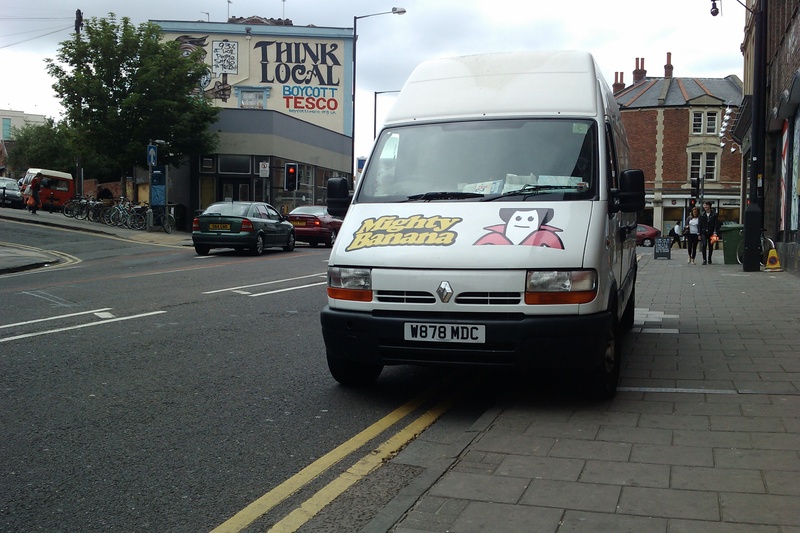 Edited to add: Almost simultaneously, Pedestrian Liberation happened to post on HGV parking and loading rules. 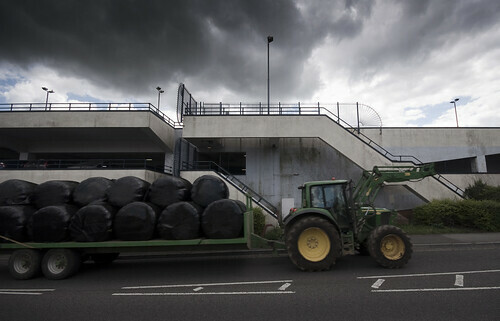 One of several town centre car parks in Yeovil, Somerset. I wonder why the main shopping street is full of pound shops, pawn shops, and “to let” signs? In 2002 I took half a dozen driving lessons in Yeovil, because that was the done thing. I got in the driving seat, was instructed to race down the dual carriageway, and found myself in Yeovil. I think the Pavlovian conditioning might explain a lot of what has happened since. In a post about designing ever increasing amounts of truck and van dependence into business models, I mentioned that an “Edgar’s Cool Water” had followed me on twitter and had justified their business with the argument that some people in London and the South East need water deliveries because their workplaces do not have plumbing. I did a double take when quickly scrolling through old phonecam pictures. The road is Gough Street; behind the brick wall on the left is the Royal Mail’s interim staff car park. 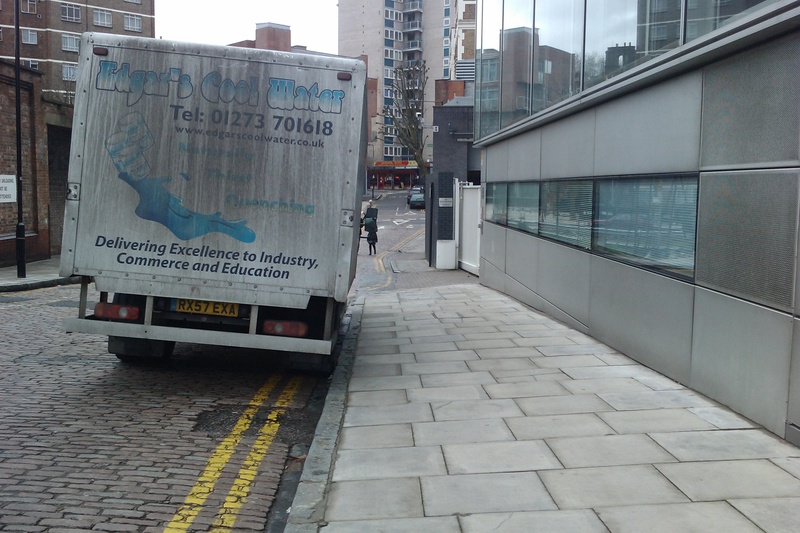 On the right is the back entrance to ITN Grays Inn Road, built less than a decade ago. I guess businesses these days just can’t afford luxuries like including running water in the plans for their new offices, or operating within the law, hey Edgar?